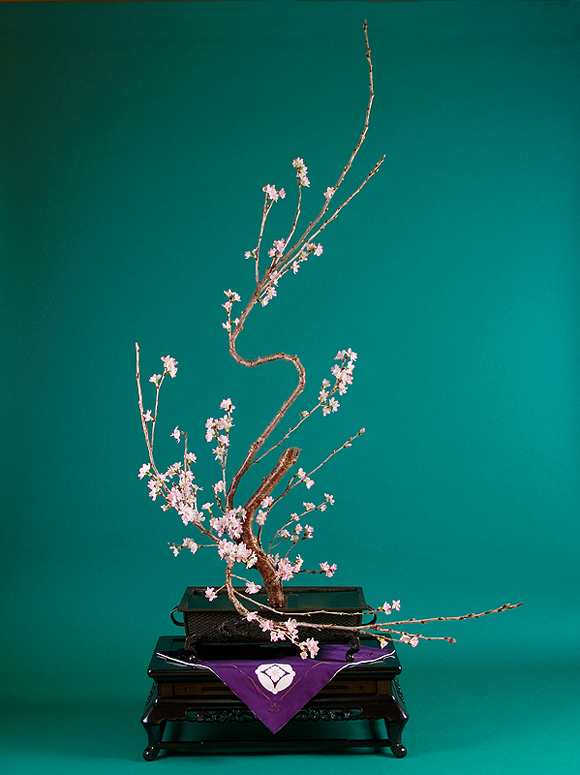 Is your Ikebana truely authentic? Lord of Kobori Enshu, founder of the KadouEnshu way the school of Ikebana, first became a master of the tea cult as a disciple of "Furuta - Oribe - Masashige". He was assigned to the Edo Castle to serve as tutor to"Iemitsu" the third in the line of Tokugawa Shoguns.ln addition to the tea cult, the Lord of Enshu was well-versed in the arts of composing "Waka" poetry, calligraphy, the Budd hism,Shintou,or any kind of oriental phlosophy. He gained further fame for his achievements as chief administrator of construction of the Shogunate's goverment.The artistic concepts of the Lord of Ensiu,named "Kirei-sabi"were also expressed in the art of flower arrangement resulting in the establishment of the Kado-Enshu. Today's head master Ichiju Ashida has been spreading all over the world his motto "Being ikebana is dijesting,simplifing,and reproducing nature's blessing on vase" which means to represent to be more natural than nature by way of adding human wisdom.In the style of Kadouenshu way,beautiful stream line or floating motional sense of movement with stems or branches are very popular.These figure are shaped by special some techniques,and the most unique one is called "kusabi-dame". This technique needs much disciplined lessons to comprehend,then this special skill is so difficult to grasp perfectly that scarcely been inherited in nowadays.Now Kusabi-dame technique comes to be like cultural heritage.We hope you can find a real Ikebana world and satisfactly Japanese air in it. 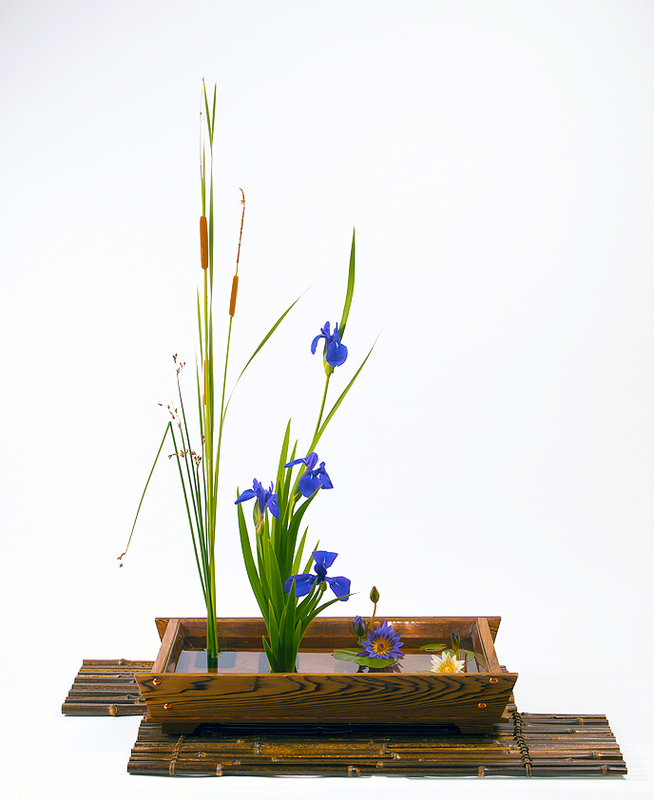 The style of Kadou-enshu's Ikebana has been recognized by other school students as " The most difficult ikebana to show " because it needs high skill to express.But if you follow the cause, it doesn't matter whichever ikebana school, Kadou(Ikebana) should be so. 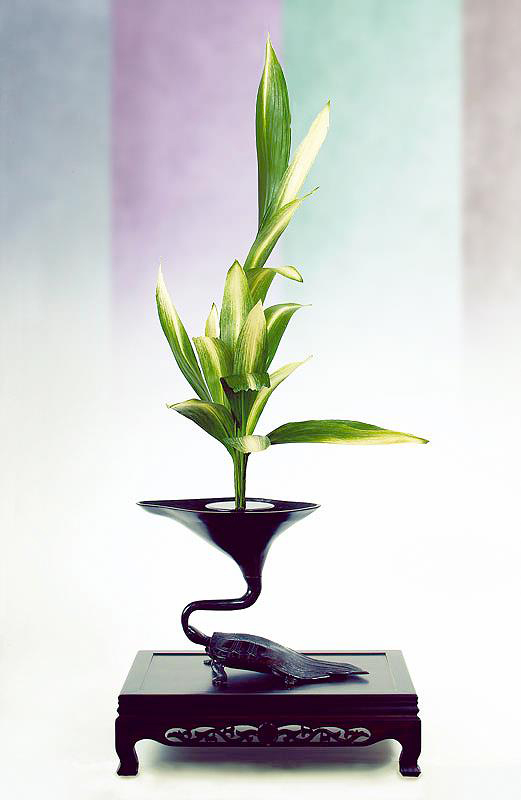 And now,You can be also a continuator of real Ikebana art. 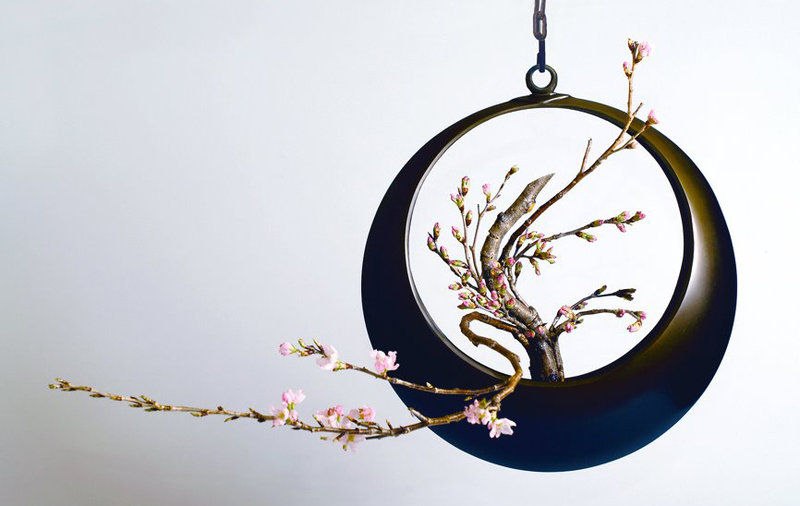 Full moon shaped hanging container. It appears the waxing and waning of the moon by shows which side crossing with branch. Reshaped branch is used to resemble the waterfall or moovement of reiki . Adding skilful bending technique on natural shape, representing a figure of Mt.Fuji by a branch motional line. "Mizumono" in Japanese aqatic plants are put on separately。Basicaly represents summer water field scenery.Japanese spatterdock must be absorbed with special method. 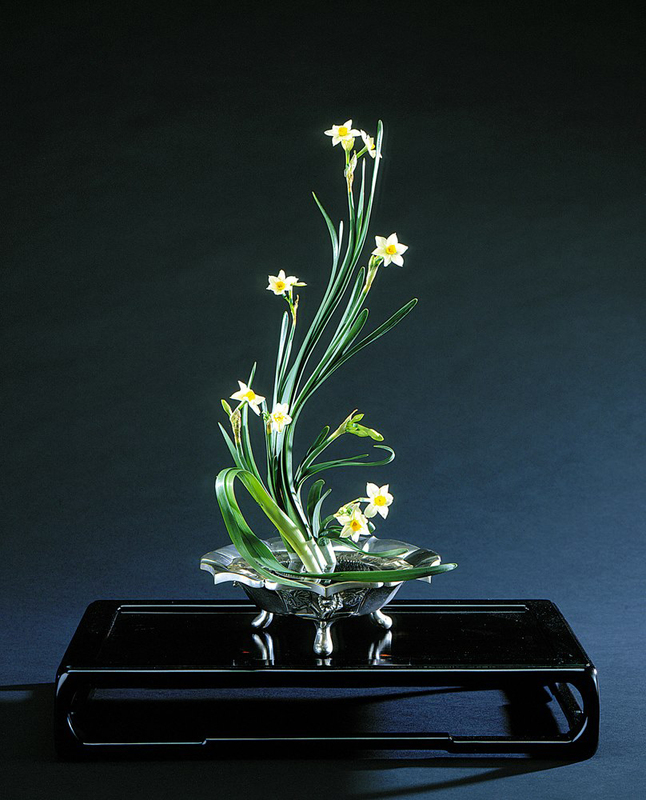 The one of the aims to arrange Ikebana is represent each plants birth character and seasonal changes.For instance,there are 3ways to show depend on sesonal changing to arrange narcissus. Kanze means water mark in Japanese.This streem looks like old tree's blanch in somewhere Japanese famous garden.It is just kind of magic to make absorb water naturaly inspite of sharp bending. This shows some basic technique in it. 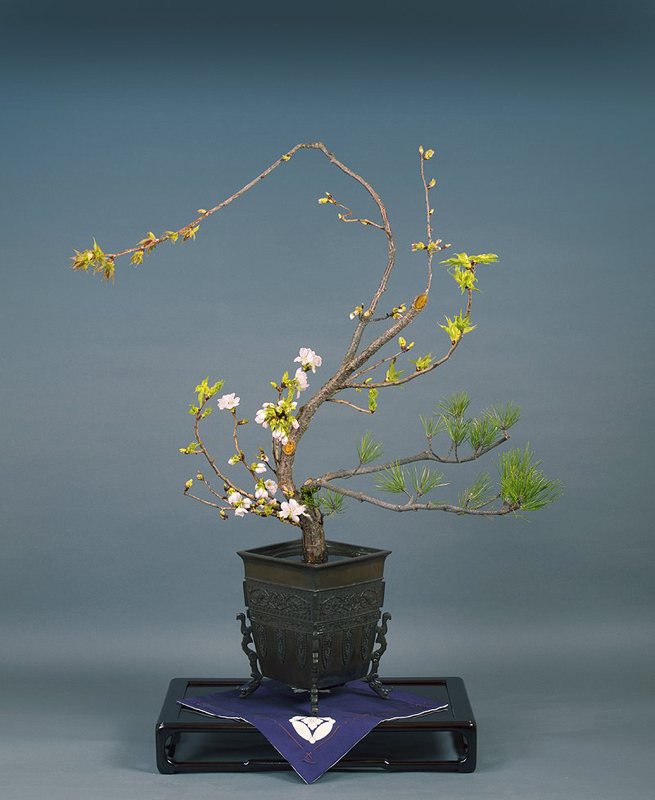 We offer all students who just begin to learn ikebana basic skills how to use scessors, knives, how to use pinholder,choose a vase,and so on. 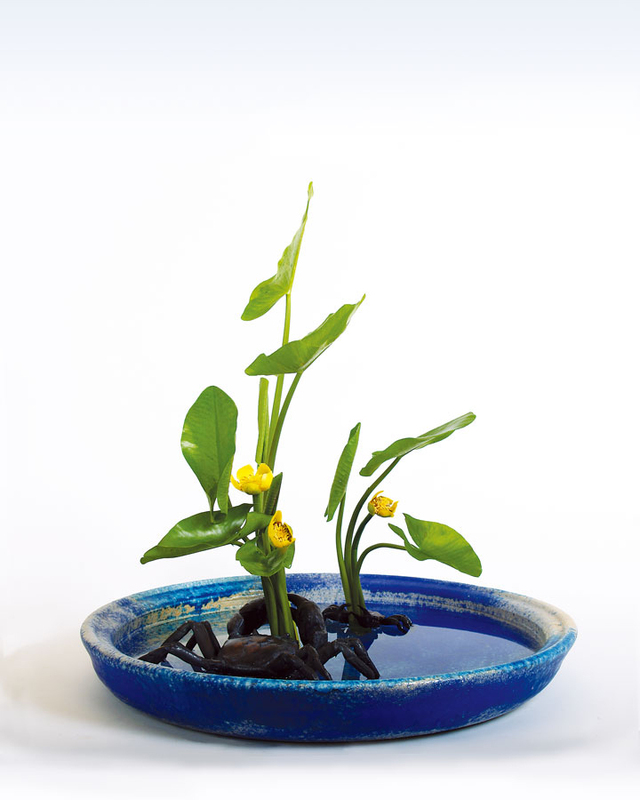 For absolute beginners,we are providing moribana lessons which has basic skill to arrange with whole kind of plants. You can also have diplomas (teacher, head teacher,will need to get 5〜7years,master needs to get 7〜10years as average) the achievements of many predecessors from 300 years ago. Ken Ashida. Born on March 8, 1967 in Kyoto,Japan. as the eldest son of Ichiba Ashida who is 7th head master of Seifu-Enshu school .In spite of the first position of successor this school, after he graduated Musahino art universty in Tokyo,and studied in Chicago,Newyork,he was balloted for a new headmaster of "Kadou-Enshu way" by the executive leaders and chairman of all chapters in Seifu-Enshu school that they made a breakaway. We Kadouenshu arrange ikebana and perform in any situation such as orchestra stage, Japanese nou stage,music live,any kind of demonstration,and so on. Also souke Ichijyu has collaborative activity with artists who are active in other areas. Performing clasic ikebana is his field of expertise yet.Ichiju Ashida has 3　direct instruction class in Kyoto city now. 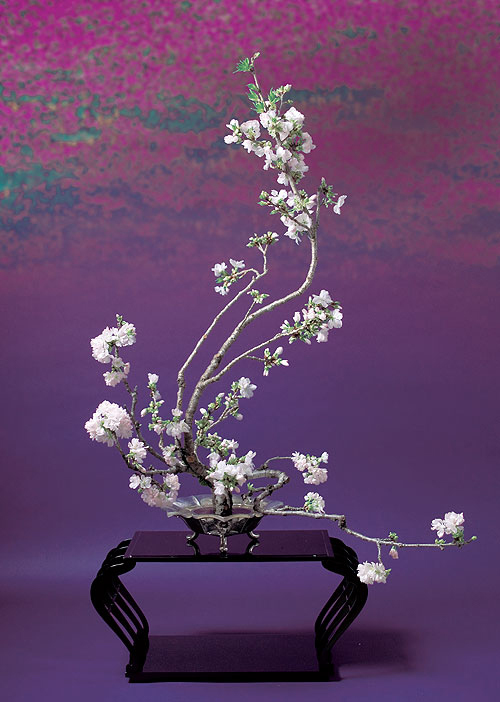 Grasping the sense of old Japanese beauty,you can put it on modern life space with your charastristic expression with your ikebana on your own. We help you got a true sense and idea of ikebanas philosophy. You don't have any hesitation to join us.